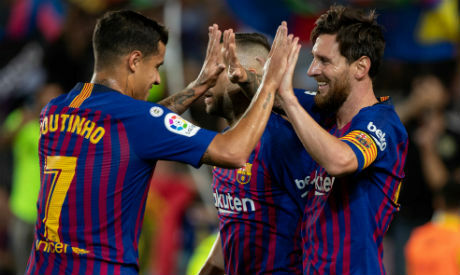 LaLiga Santander returns this weekend with joint leaders Barcelona and Real Madrid aiming to continue their 100% records on tricky trips to face Basque sides Real Sociedad and Athletic Club, respectively. All four of Spain’s Champions League teams are playing Saturday ahead of the return of UEFA competition next week, with Atletico hosting Eibar and Valencia welcoming Europa League-bound Real Betis. Lionel Messi's four LaLiga strikes so far this season have helped his Barca side currently top the LaLiga Santander standings on goal difference. But the Blaugrana will face a difficult task at La Real’s Anoeta stadium, where the Catalan side won 4-2 last year having drawn one and lost three of their previous four visits. Meanwhile, Karim Benzema has been in top form for Real Madrid with four goals over the opening three games, although that form will be tested by an Athletic side unbeaten under their new coach Eduardo Berizzo. Los Leones have also held Los Blancos to draws in their last two LaLiga meetings at San Mames. Down in the capital, Diego Simeone’s Atletico side will be hoping to bounce back from a defeat two weekends ago at Celta and move up the table. Eibar, however, visit the Wanda Metropolitano confident of springing a surprise having drawn there 2-2 as recently as last May. Marcelino’s Valencia have also had an unexpectedly difficult start to 2018/19 and will be looking for a boost against a Betis outfit travelling to Mestalla buoyant from their ‘Gran Derbi’ win against Sevilla before the international break. The weekend’s schedule begins Friday evening when Huesca host fellow LaLiga Santander newboys Rayo Vallecano in the first-ever LaLiga top flight game at El Alcoraz, with the Aragonese club's fans keen to see their impressive start continue. Sunday lunchtime brings action in suburban Madrid, where Leganes host Villarreal with both teams looking for their first LaLiga win of 2018/19. Early afternoon sees Espanyol take on Levante, with each side having registered a win, a draw and a defeat so far. Sunday’s early evening games has Valladolid aiming for their first goals and first victory of the campaign against Alaves. Getafe visit Sevilla in the late match, with both teams looking to improve on uneven starts to the season. The weekend’s entertainment concludes on Monday evening, when third-placed Celta, still unbeaten under new coach Antonio Mohamed, travel to face a Girona side who have quickly picked up the methods of their incoming manager Eusebio Sacristan.